If you don’t back up your files at some point you will lose them. We rely on mechanical storage to keep our information and inevitably it will fail. People used to say it didn’t matter since it was only a resumé or invitation on a home PC: that’s changed since we buy our books and music online and take our photos and videos digitally. A backup is a copy of your files somewhere else: CD or DVD, other PC, [intlink id=”335″ type=”post”]Windows Home Server[/intlink], or in this case online. There are some excellent free services available and today we’re looking at Mozy: it offers free and paid options. We’re looking at the 2 GB free option today. 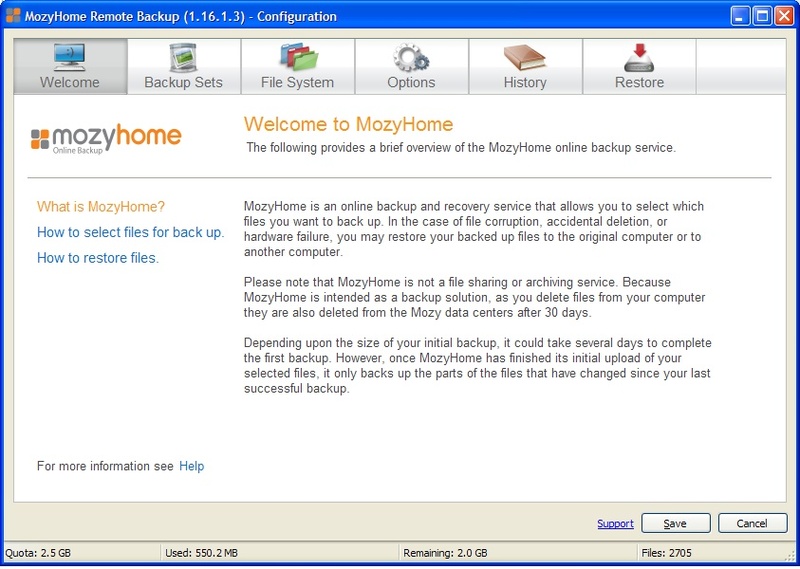 Installation is very straightforward, as is everything about Mozy: it’s meant for any and every computer user. You can pick your files to back up by category: Favorites, Spreadsheets, Music, or by folder and file. Mozy runs as a 58 MB service; once you pick your files you schedule the backup and that’s it. Speed is of course based on your internet connection, but the first backup is the only time killer since Mozy will only backup the changes made to your files. It’s simple and effective, plus it requires no intervention from the end-user once set up, this eliminating the biggest problem with backups in general, that of user laziness. To restore files you open the tray application and select your files, either by category or file and folder. Again very simple and direct; depending on how many files you’re restoring it could take a while as you’re limited by your internet connection speed. Therein lies the issue with all cloud based backup and why I recommend it for personal use only; you can’t wait two days for your business files to restore. Free online storage does work well for a secondary or tertiary backup of key files since you can’t beat the price. I’ve been using Mozy for a few years and those sharp-eyed readers will see my quota is 2.5 GB: that’s because I’ve referred two friends who signed up. If they use my referral code I get an additional 250 MB. Between now and January 10th anyone who signs up using my referral code will get an additional 500 MB, as will I. It’s free to use so why not give it a try. 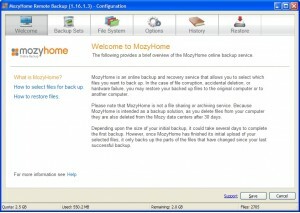 MozyHome works pretty well for me – on both Mac and PC. MozyPro needs a lot work, however – the interface is extremely convoluted and not user friendly at all. Are you still using Mozy? I’m very impressed with how far their software has evolved. I’m a long time user myself and was worried when EMC made the purchase, but glad to see things have been rolling alone.